I just found this fabulous lunch tote at the Disney Store for just $6.00!! 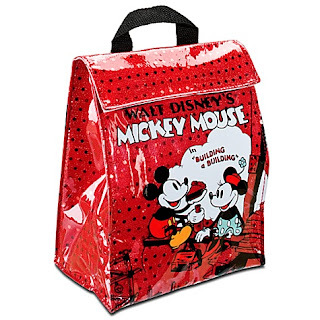 "Mickey enjoys a high-rise meal accompanied by Minnie on this Disney Nostalgia Lunch Bag. Inspired by the 1933 short Building a Building, this shiny, sequined bag features a food grade lining that makes it perfect for school snacks."